What made you think of Broadsided for this poem? Poet Marci Calabretta Cancio-Bello: First, I’m a huge fan of Broadsided’s mission, and always enjoy seeing the new broadside every month. Art and poetry complement each other wonderfully, and I love the way Broadsided offers expansive space for small poems to thrive in the real and digital world alongside so many different artistic styles. What inspires you in this poem? What drew you to it? Artist Elizabeth Terhune: Inspiration. First, mantis. Drawn up short, abruptly, thought’s space interrupted, invaded, to fixed attention, hearing: mantis. Synonym: mystery. Ghost Mantis. Doubles that. Second, description, “made of after-autumn”. Seemed a color but it isn’t really describing color. Curious. Time and color, pulled together. Third: “crackling & bent as constant prayer”. Sound (ominous) enters the quiet space of the poem and things get way complicated. Unfortunately, I cannot tease apart my associations here, but the poem moves into large territories. 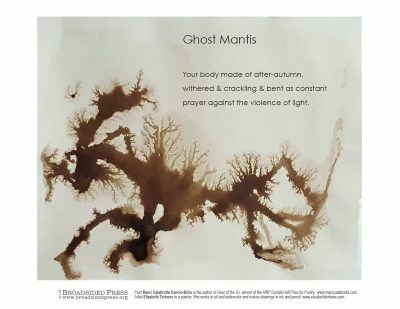 Poet Marci Calabretta Cancio-Bello: I hoped that the artist would look up the Ghost Mantis and be as enamored of the creature as I am (I hope everyone reading this will pause and do the same). Elizabeth’s rendering is absolutely gorgeous. But the ghost mantis, unlike my book’s illustration, is a small, equator-area, mantis. And it is, indeed, a creature that looks to be covered in flaking bark that trails its body, something like the ancient Chinese statue I saw of a robed dancer, sleeves, dress, head moving into space in multiple directions, yet anchored to the gravitational core. It is also the size of an adult human thumbnail. I wanted some hiddenness, age, archetype presence. I opted for ink, a flattened form but with dendrite growth, like a petroglyph that connects to rock, preserving time and process, partaking of magic. Poet Marci Calabretta Cancio-Bello: I’ve always thought of this poem as a bit scrappy, but when I saw the precisely smudged and veined edging of the mantis shape, I couldn’t help thinking of that last line as empowering and beautiful for both the mantis and the reader. What surprised or struck you once you saw the finished broadside? Poet Marci Calabretta Cancio-Bello: With such a small poem, every word is pressured to be meaningful, and I assumed the artist might take one word and unpack it, but somehow Elizabeth allowed every nuance to shine simultaneously as both earthy and ethereal in a way the language alone couldn’t do. Artist Elizabeth Terhune: The mantis is larger than all of the words! Poet Marci Calabretta Cancio-Bello: Ekphrastic work is hard for me, mainly because I never feel like I can do justice to the visual art, so I love where the challenge takes me and what I learn from it, but none of it has been publishable. Artist Elizabeth Terhune: This is like asking how do you enjoy your involuntary muscles! Poet Marci Calabretta Cancio-Bello: I was imagining Mozart’s Requiem Mass in D Minor, but it might actually be more like a Beethoven concerto. Artist Elizabeth Terhune: Drumming. Some flute. Something that might accompany a scene from a Kurosawa or Mizoguchi movie. Flinty. Certain bluejay calls. Poet Marci Calabretta Cancio-Bello: I just finished Circle by Madeline Miller, and I’ve been recommending it to everyone. Artist Elizabeth Terhune: Many. I’ll mention Women’s Work: The First 20,000 Years, by Elizabeth Wayland Barber. Poet Marci Calabretta Cancio-Bello: I just got back from Seoul, South Korea, where I visited Tapgol Park, the starting point of one of the Korean Independence Movement protests of 1919. The park has several powerful bas-relief statues depicting scenes from the Movement that I can’t stop thinking about. Artist Elizabeth Terhune: Thank you to Marci Calabretta Cancio-Bello. And to Liz and Broadsided team. Artist Elizabeth Terhune is a painter. She works in oil and watercolor and makes drawings in ink and pencil. elizabethterhune.com. 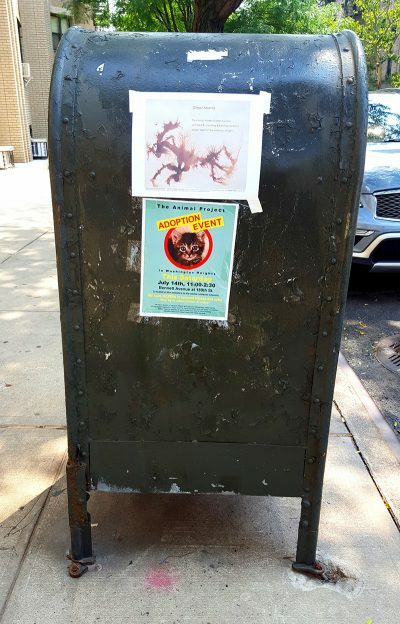 The artist Vectorizes a mailbox uptown Manhattan. Washington Heights.